X-Mind Unity Dental X-ray with SOPIX Digital Sensor Inside! With its elegant style coupled to the cutting edge patented ACE technology, X-Mind Unity brings the standard of an X-ray generator to a very new level. Perfect accuracy and staff protection are what no other X-ray system has been able to reach. Exclusive Advantage: The SOPIX sensor will activate and stop the generator, eliminating any risk of overexposure for both the image and your staff in your working area. The X-Mind Unity communicates with the ACE technology present in the SOPIX Inside. The generator analyzes in real time the amount of X-ray emission needed to enable perfect exposure of the image and therefore reduces staff exposure. Your diagnosis is more reliable than ever. The precision given by the combination of X-Mind Unity and the SOPIX Inside provides you with the most consistently clear image quality available. This pairing reduces the need for retakes and results in less time under anesthesia. It also means less frustration and a shorter learning curve by eliminating overexposure. The high frequency delivered by X-Mind Unity makes up for voltage failures. The X-ray tube stocks sufficient energy to offer you identical results, exposure after exposure. X-mind Unity is not only an X-ray generator; it is also a daily work tool improving your comfort and productivity. With its advanced ergonomic design and intuitive grip, only one hand is needed to move the X-Mind Unity. Positioning can be done with minimum effort or stress. The anti-vibration and anti-movement mechanism built into the X-Mind Unity keeps the unit steady and still, ensuring the precision of your shots. Just grab, position and shoot! Finally, X-Mind Unity is configured to fit into any treatment area. Whether top mount or bottom mount, different arm lengths offer unparalleled flexibility for how you install your x-ray generator. No need to compromise – install the X-Mind Unity exactly as your operatory requires. X-Mind Unity has manual controls that will also work with your existing sensor, film or phosphor plate if needed. So Sopix inside can be added later if needed . 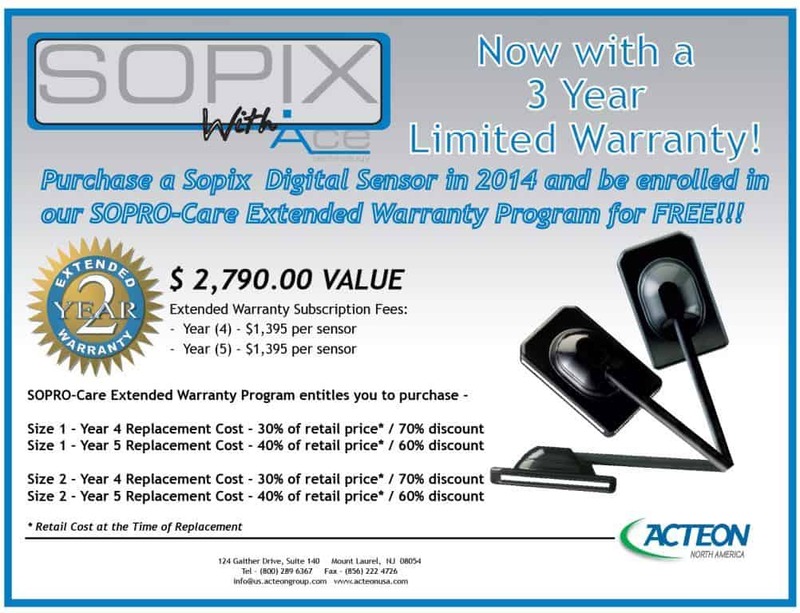 SOPIX is the ONLY digital sensor on the market that never overexposes with the highest detail available every time. This gives SOPIX users consistent advantages when viewing tooth resorption in cats, when dealing with the zygomatic arch and ensures overall comfort and confidence in diagnosing disease. The SOPIX greatly reduces staff frustration by always producing an image with perfect exposure, which saves time and money by eliminating the need to take multiple shots. • 3-Year Manufacturer’s Warranty with Free 2-Year Extended Warranty. • Includes User-Friendly Veterinary Specific Software that allows users to focus on the animal and not the software. • Software can be networked throughout your hospital with no additional charge. • Images are organized using the triadan numbering system. • Multiple dental charts are available and software users have the ability to customize dental charts based on preference. • Oscilloscope and computer diagnostic tools in software for accurate support. • Detailed Client Education Sheets can be printed out to show X-rays to clients. • Includes a team of Technical Support Specialist. • Free Remote Software Training. • Cut edged sensor design allows easier sensor placement when shooting the molars. Dental Focus™, LLC has 20 years experience in veterinary dentistry and 12 years in dental radiography. We have worked at hundreds of wet labs and have unparalleled experience in this area. This single-minded focus allows us to provide the best product with the best support available. SOPIX is only sold direct to you by Dental Focus™, LLC to ensure accurate information and exceptional service the first time.